Thanks to shared knowledge, advancements in husbandry paired with state-of the art equipment and better understanding of corals biology, more people are able to create and maintain beautiful reef tanks. 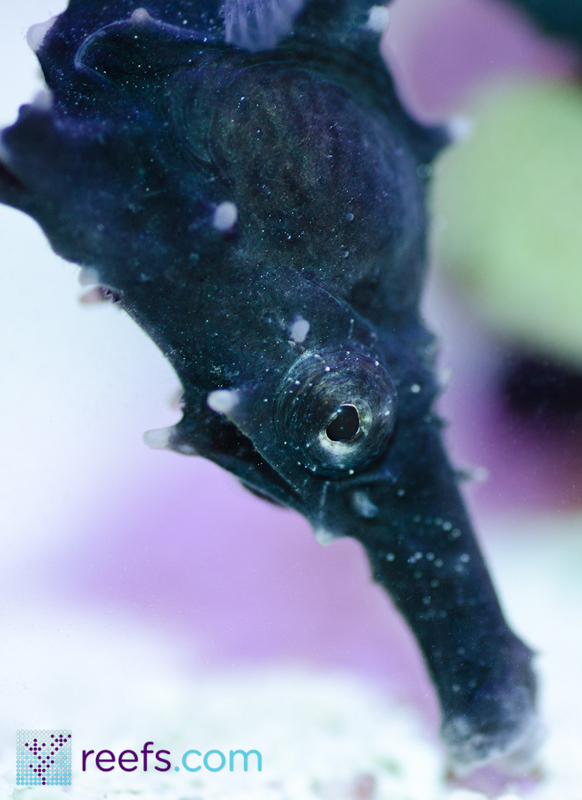 Despite all we know about keeping marine life in captivity, there is no one recipe for all problems and challenges associated with reef aquariums. 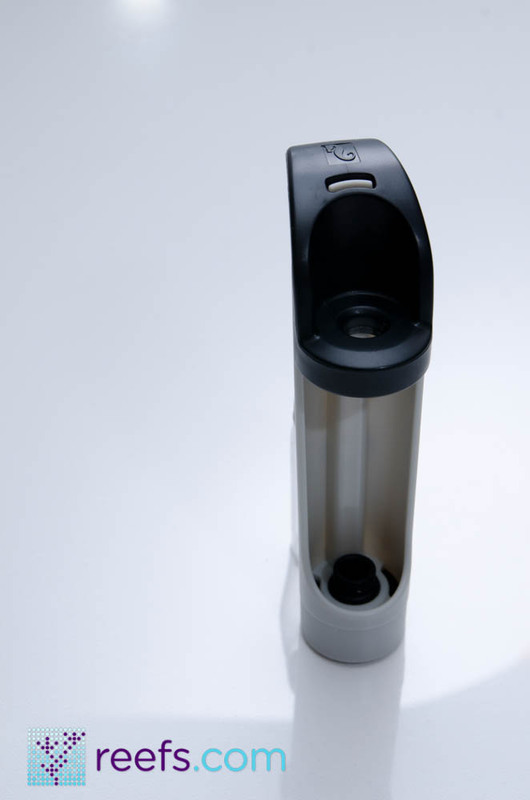 Magic potions, miracles-in a bottle, innovative equipment and countless dosing variations are all part of a quest to find the Holy Grail, but so far, it just doesn’t exist. 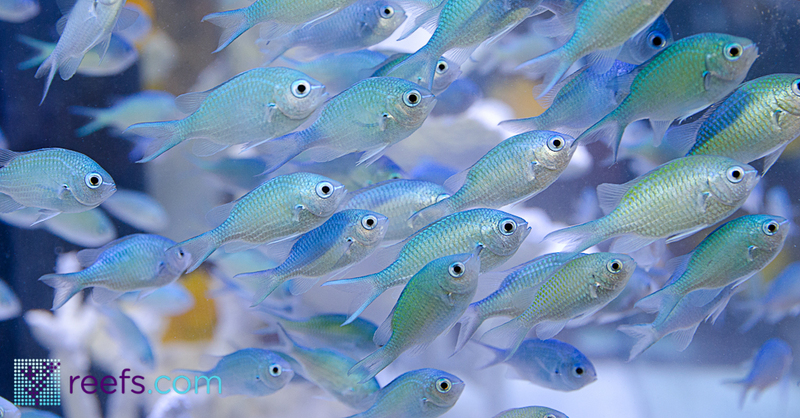 Every single reef aquarium is different, starting from source of water, salt mix used, lighting up to the choice of animals housed. 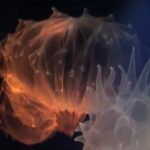 Count into that the sophisticated nature of sessile invertebrates, their chemical interactions and enormous range of habitats they are collected from and we quickly realize there is no “sweet point” and the best we could do is create optimal conditions for corals to live and propagate. 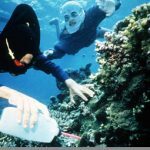 All images by author There are, however, two aspects every successful reef story share: water changes and knowing your saltwater parameters. 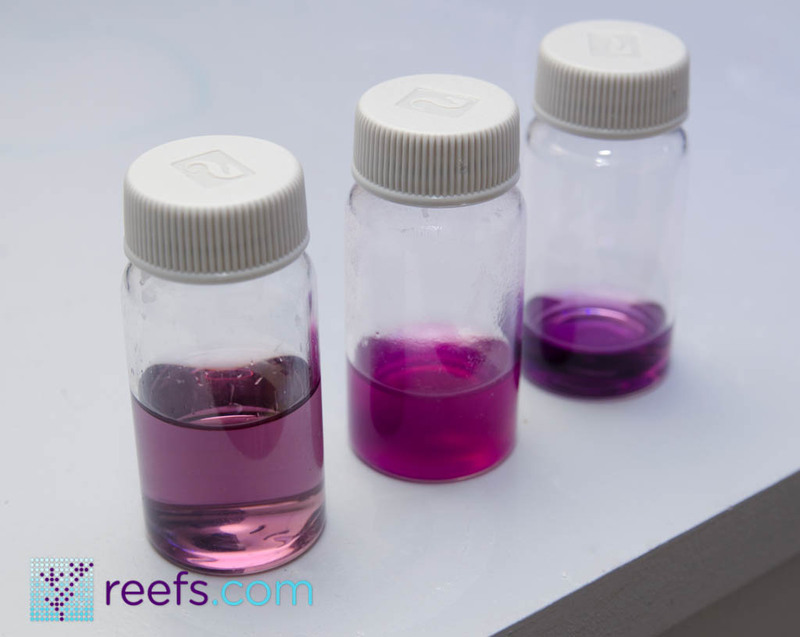 While the first is obvious – no nutrient reducing chemical can substitute for good ol’ water change, testing for parameters requires some basic knowledge about seawater elements and their importance in reef dwelling fish and invertebrates husbandry. Basic parameters every reefer needs to know and check regularly are temperature, salinity, ammonia levels and pH of water. 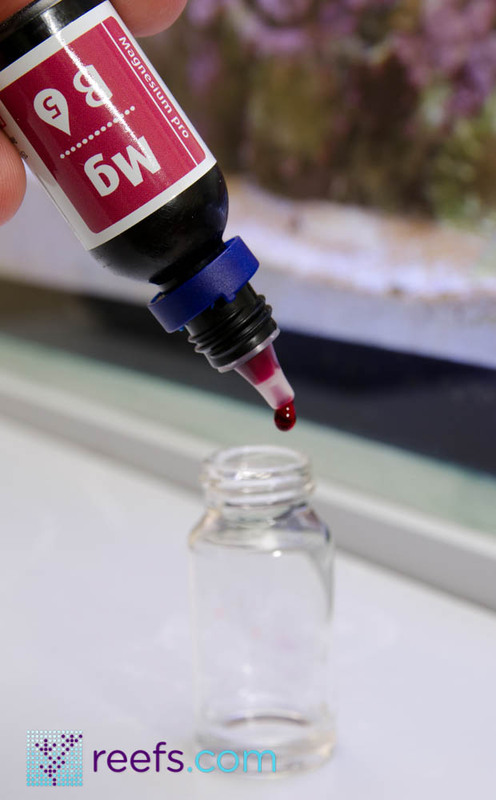 In order to provide for most photosynthetic corals and other invertebrates, we need to control nutrients in water by testing for phosphates (PO4) and nitrates (NO3). 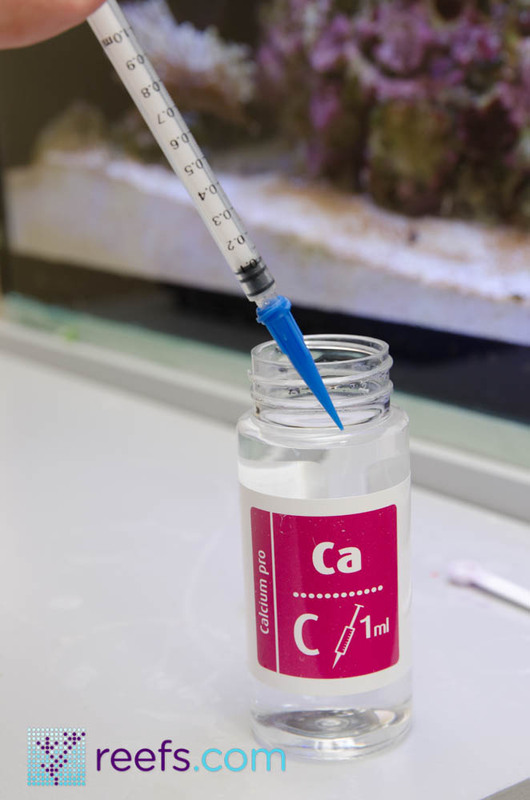 Finally, all stony corals use calcium carbonate to build their skeleton, therefore in order to supplement their grow we need to regularly test for calcium (Ca), alkalinity (kH) and Magnesium (Mg) dissolved in water. 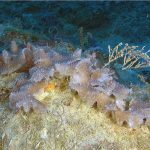 Finding the right balance between those three coral building elements is a key to maintain a successful stony corals and clams dominated reef tank. 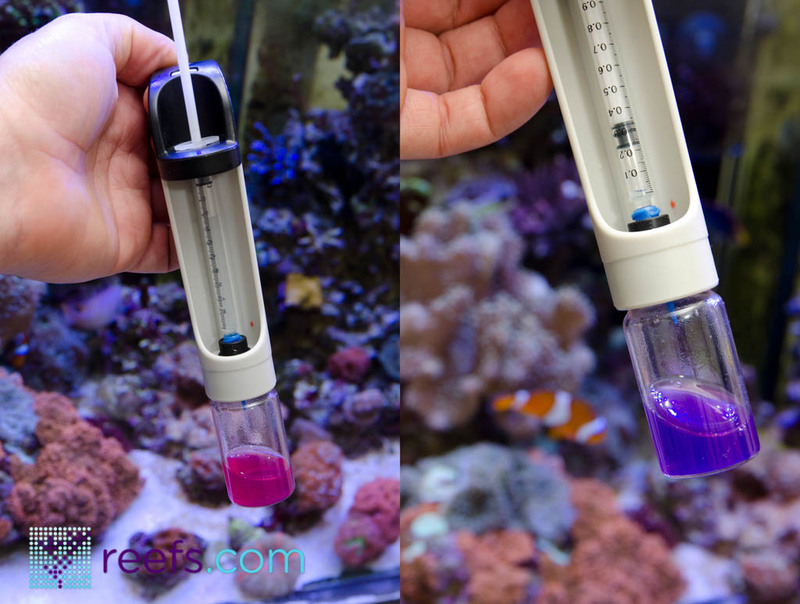 To check for all those elements, we use aquarium grade test kits that are readily available on the market. When shopping for test kits, consumer’s choice is driven by several factors: -accuracy- this one is obvious, if test is not accurate it doesn’t serve it’s purpose and should be disregarded -easiness of use- we hobbyists are patient people, but nobody is willing to spend too much time figuring out how to prepare water sample and read test results -price to value ratio- how many tests one can perform before running out of reagents – clearly stated expiration date Red Sea Reef Foundation Pro Test kit is a topic of today’s review and a part of Red Sea new line called Red Sea Coral Care, featuring several products from salt mix, major and trace elements supplements, coral growth and color enhancers to various test kits. 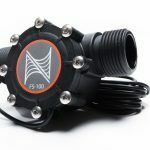 Let’s find out how Red Sea’s multikit stands against other major brands in terms of accuracy, user-friendliness and value. 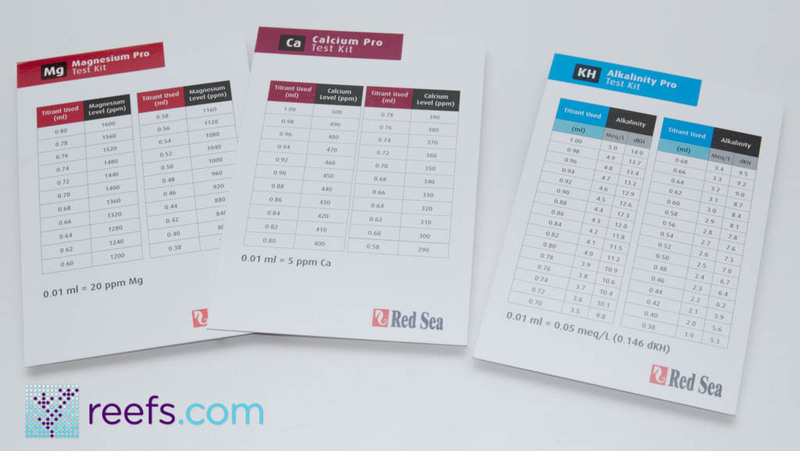 Red Sea Reef Foundation Pro Test kit consist off separate test kits for three major elements directly responsible for stony corals growth and well-being- Calcium, Alkalinity and Magnesium, sold as one package. Let’s peer inside the box and see what’s hidden there… 1. Unpacking The outer cardboard packaging informs us about the product inside in several different languages. The accuracy, range and approximate number of tests are printed as a table on the back. On the bottom we have a clearly printed expiration date (mine is 04/15). First positive surprise comes right after unpacking the box, in a form of a sturdy-looking, black plastic container that holds all testing equipment. No more flimsy cardboard boxes that fell apart with prolonged use. Very nice, indeed! Pop the lid and little chemistry lab reveals itself, tightly packed inside the box. 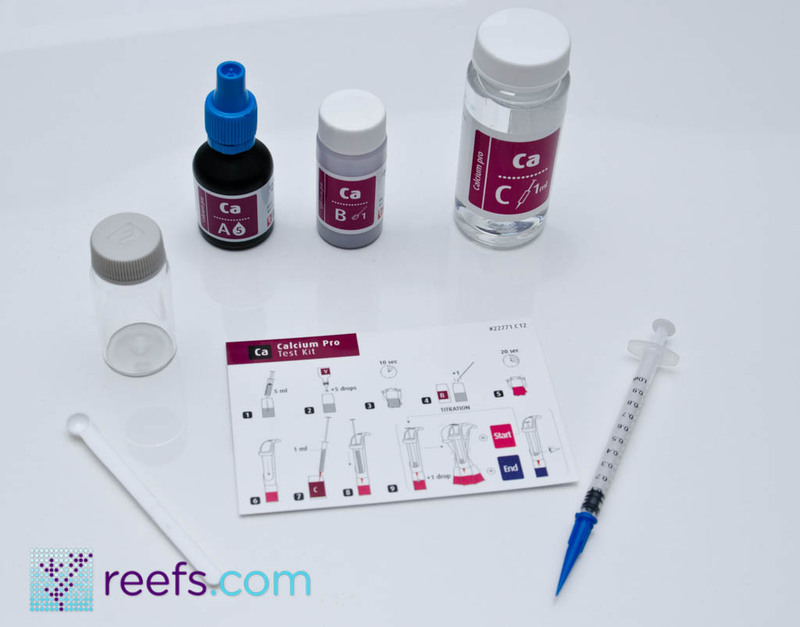 Reef Foundation Pro Test Kit includes: -one 10ml syringe for water samples -three, color coded (one for each test kit) 1ml syringes a plastic device called Titrator (more on that later) -60ml plastic bottle filled with alkalinity reagent -three bottles of Ca reagents plus a measuring spoon -three bottles of Mg reagents -printed instruction for Reef Care Program -three splash-proof cards (one for each test) with instructions and test kit results table -three glass vials clipped to the top part of the package The package leaves very good first impression, with only one plastic container Red Sea managed to fit all three test kits with additional testing equipment, saving precious space in the “fish closet”. Color coded reagent plastic caps and syringe nozzles prevents unwanted mixing of different solutions. 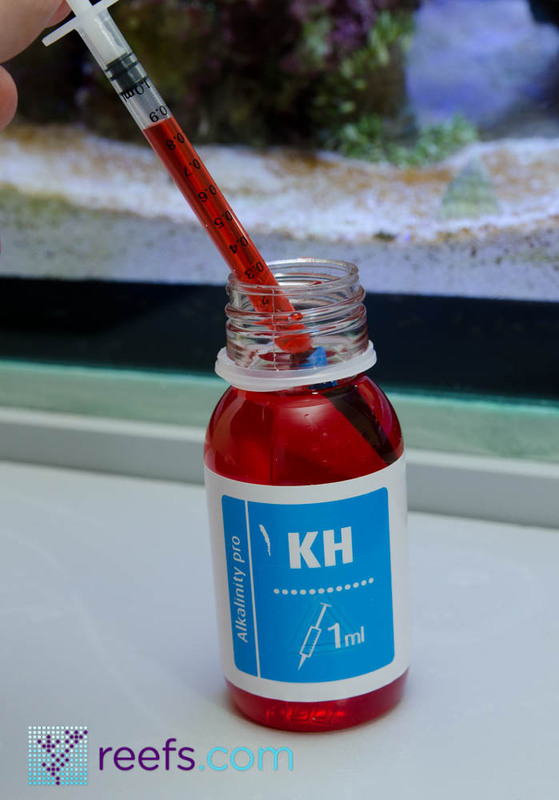 However, the most interesting part of Red Sea Test Kit is the earlier mentioned Titrator. 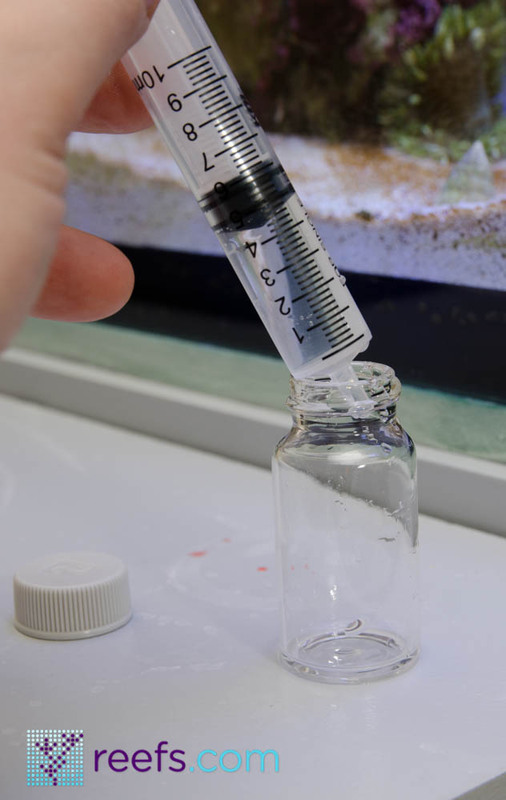 This clever little device is a test vial and 1ml testing syringe holder. The bottom part is where you screw in the vial, while the rubber gasket holds the syringe firmly, preventing any “missed” drops. 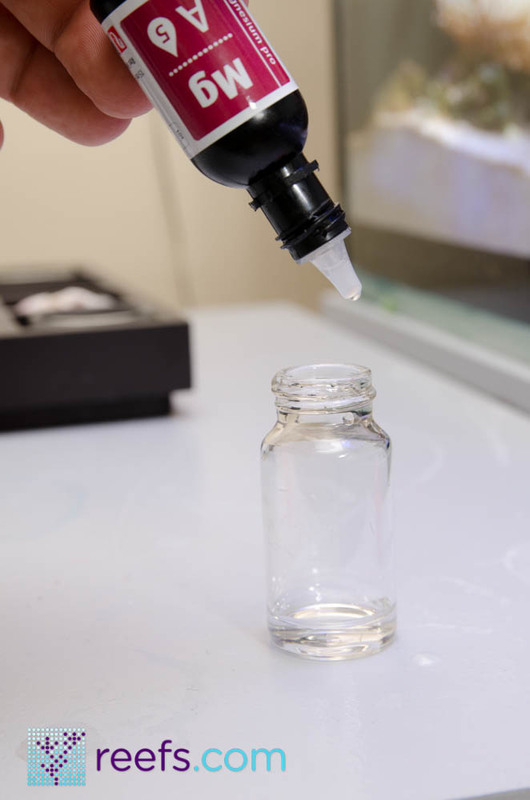 Using titrator is a breeze- adding reagent drops and mixing solution becomes a one hand operation while the seal between testing vial and titrator eliminates possible spills. 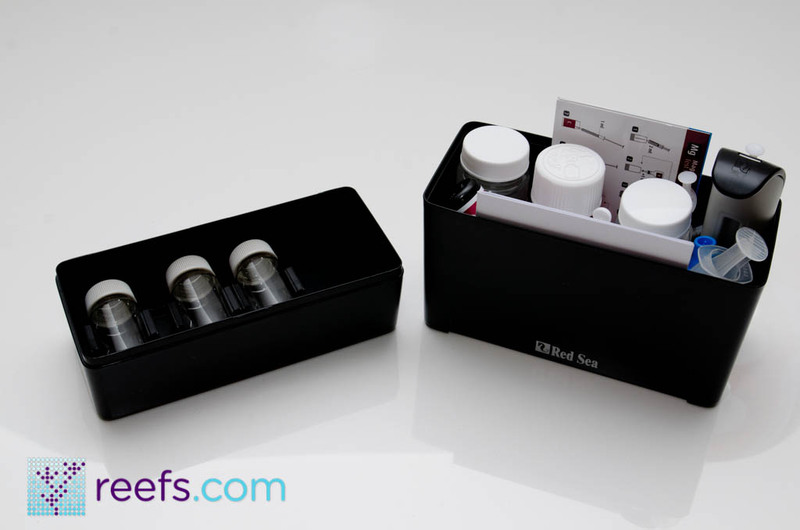 I didn’t have the opportunity to laboratory test my water samples, but I’ve compared Red Sea test kits with other two major test kit manufacturers- Elos and Salifert and found them identical . Additionally, I’ve performed KH test using laboratory checked 6.7dKH solution and it proved to be dead accurate. 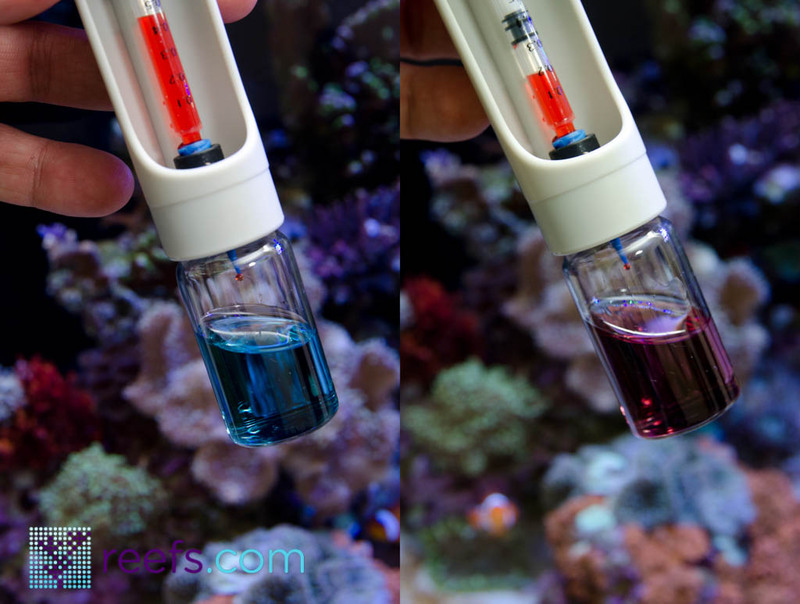 I have no doubt Red Sea tests accuracy is in par with leading aquarium grade test kits manufacturers on the market. 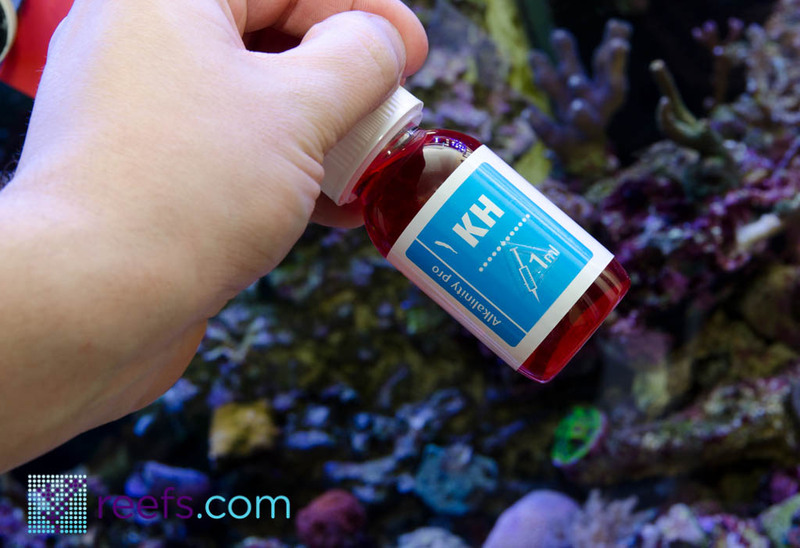 Red Sea Reef Foundation Pro Test Kit costs around $50-$60 at online stores, which is a great value compared to buying each test kit separately (Calcium and Magnesium test cost $30-$35 each and KH test is priced around $25). 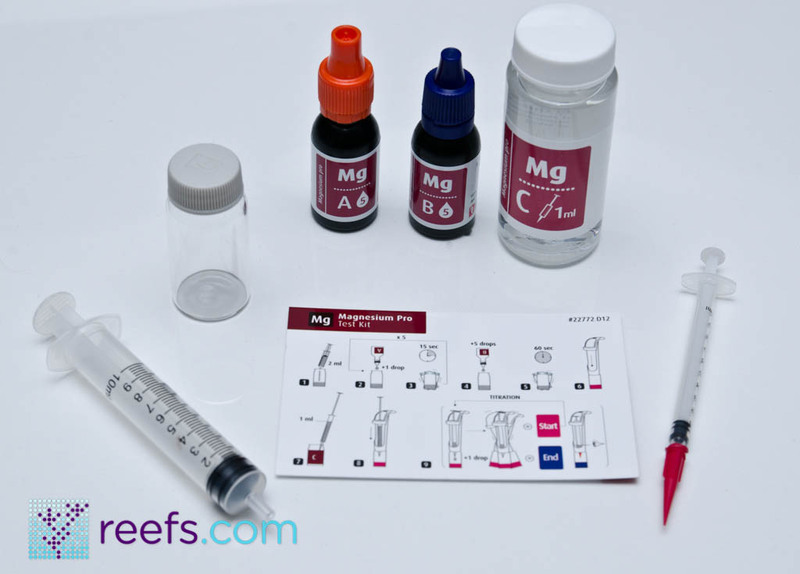 In addition to that, Red Sea offers Reagent Refill kits for around $13, so basically after spending $50-$60 initially, the cost of new MG,Ca and kH test kits drop down to $13 each time you buy new kit. 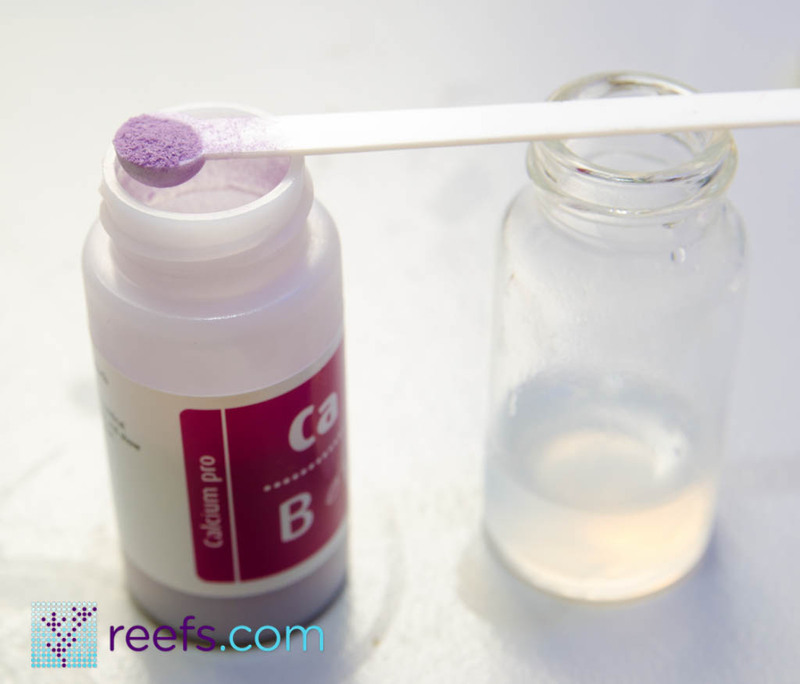 Both Calcium and Alkalinity test last for approximately 75 test, while Magnesium allows for 60 separate tests, which, compared to other major brands, is industry’s average. 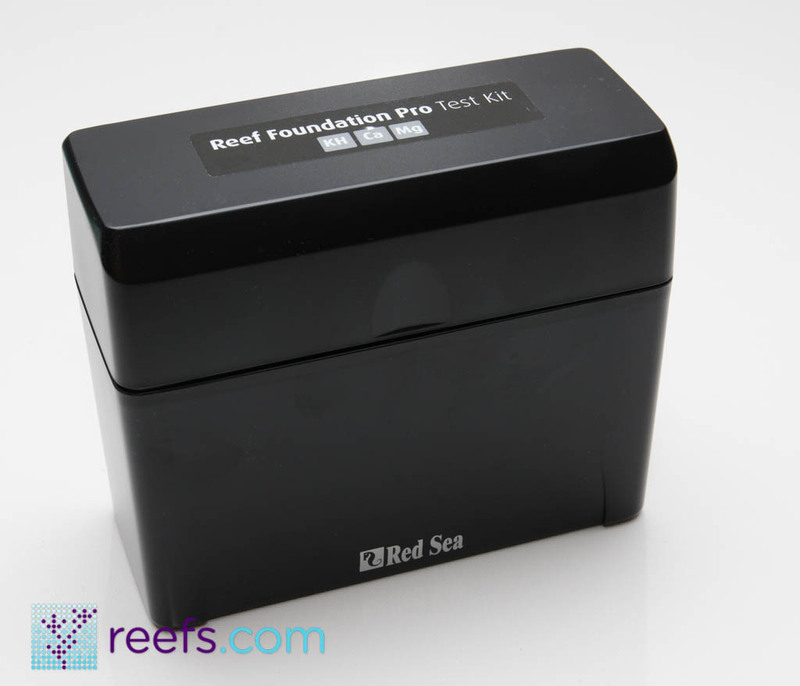 I have to admit I was trying hard to find something I wouldn’t like in Red Sea Reef Foundation Pro Test Kit and I failed. 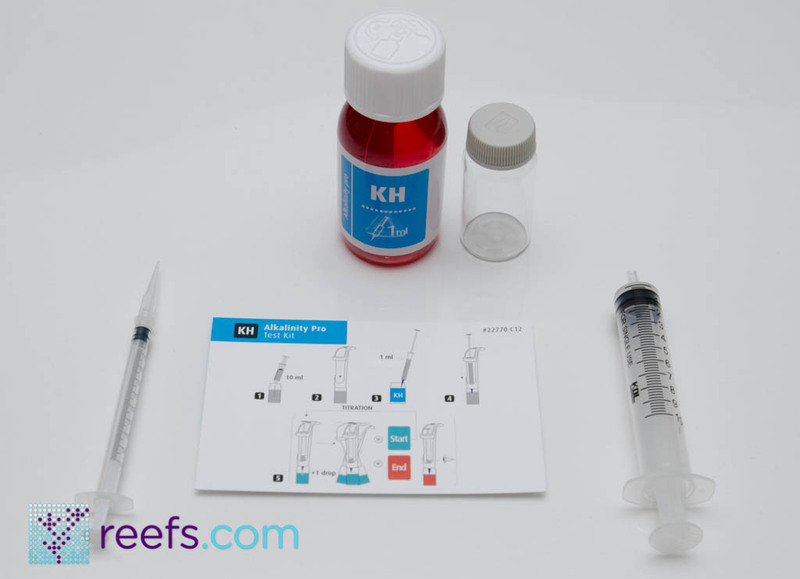 It offers very good accuracy, great packaging, market leading price-to value ratio and each test follows a simple, fairly time-saving procedure that is easy to remember and repeat. 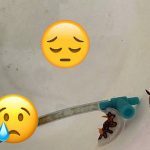 Being a SPS keeper that need to check his levels on a regular basis, Red Sea made me switch to using their kits as a preferred method of testing my water. 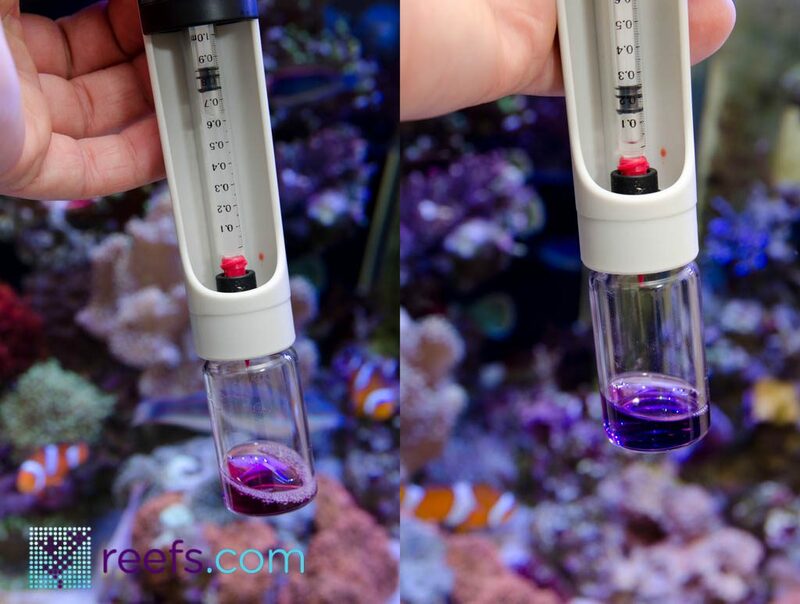 If you’re looking for an accurate, user-friendly test kit that won’t leave your pockets empty, I recommend trying Red Sea Reef Foundation Pro Test Kit. Happy reefing! 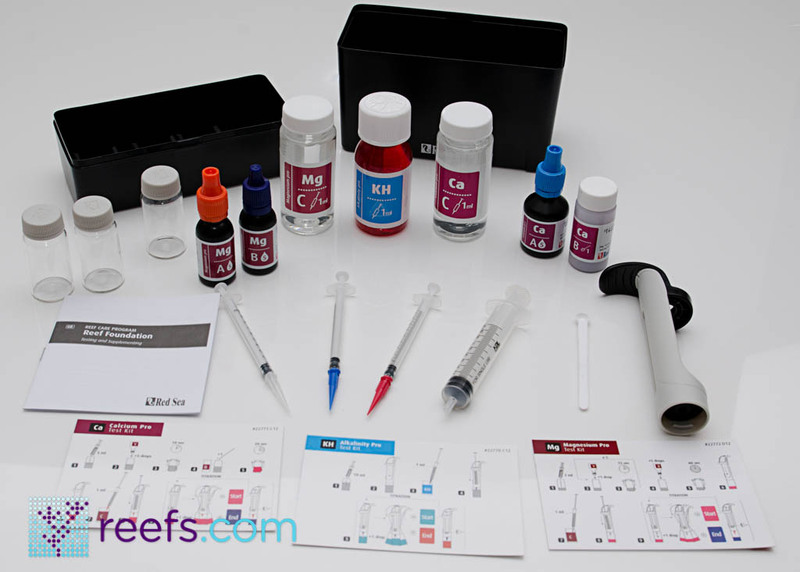 Nice review of this test kit. What I really like is that little extra spent on ergonomics that makes testing that much more enjoyable. 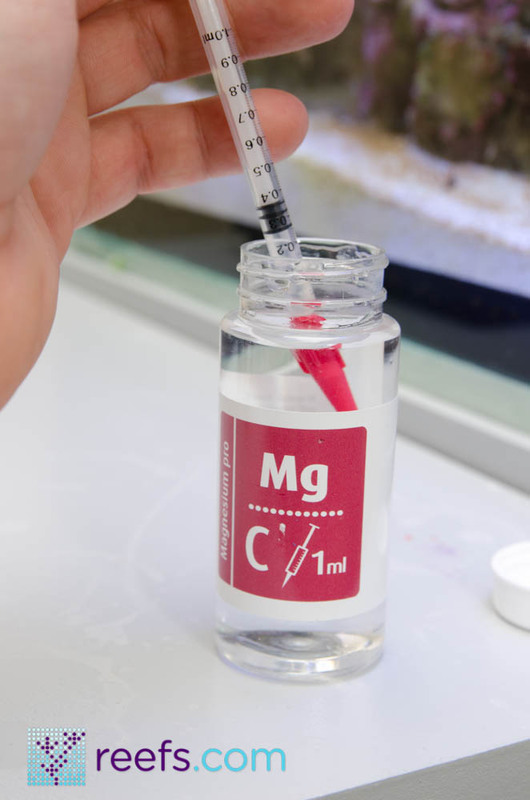 One error with the Mg testing in the article……you only added reagent A once…..you need to add it five times, with a 15 second shake between each drop addition. Yep, that’s what I did but made a mistake while writing the article. Thanks for correction!